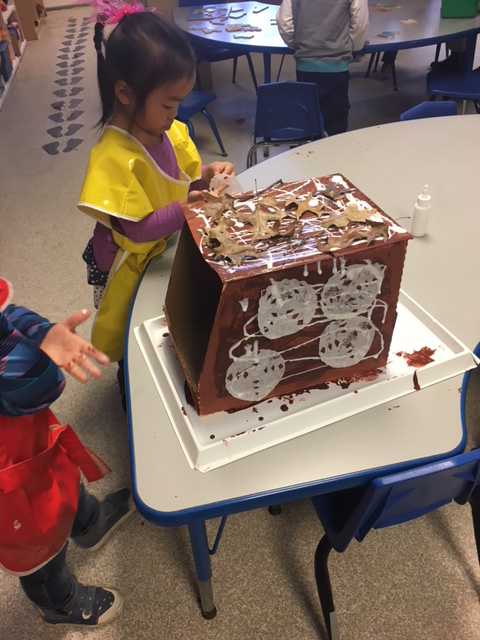 December month brings a lot of different winter activities and exciting open discussion for our preschoolers to expand their thinking about the seasonal changes. We are also working on our new long term assignment: Project Approach our theme is about: Transportations. We read books on climate changes and on Transportation. The children enjoyed the book titled: Little Raccoon Catches A Cold. From this book they learned more about following directions for safety and identifying the different garments we should wear to keep ourselves warm and protected from getting sick like little raccoon; understanding the importance and differences of getting properly dressed before going out to play during the winter months verses the warmer months passed; they even understood how silly little raccoon was thinking he could catch a cold using a baseball mitt, butterfly net or a bucket. One child said: “ Little raccoon was too excited to go outside with his friend red squirrel; that’s why he forgot to dress properly ; then him got sick and his mom made him soup to feel better”. Another child said: “Little Raccoon forgot to eat his lunch and a cold caught him”. Another said: He didn’t listen to his brother”. Another activity we did During Small Group Time; since everyone was not prepared to play outside when it snowed, we filled two large trays with snow one for each table and each child made their own personal snowman; that was a quick cold fun indoor experience and experiment the children really enjoyed it very much. We are also reading and talking about bears and their habitats, while creating our own classroom Bear habitat display. We also made some classroom winter displays. We are reading various book: We All Go Traveling By, Tons of Trucks, Things that Go and Duck in The Truck as we work on our Project Approach, as you can see we are moving along on our Transportations activities using various boxes to create them; Much more to come on this long term teamwork. Have a safe and enjoyable winter break and a very Happy New Year!